The weekend of April 29-May 1, I attended the 2016 Massachusetts Poetry Festival in Salem, MA. I've lost count, but it's at least the fifth year I've taken part. This year seemed different, but I haven't been able to put my finger on why! In looking over my notes, I find most are barely legible, so, my review this year will consist of a bunch of random quotes, titles of individual poems or books suggested by poets, and, a few photos. Poetry "has a sustained life in culture." The "meaning is in the relationship" between the poem and the reader. "The reader has been left out of the equation." A poem "gives us this gift of privacy plus participation." "Read a poem aloud--you are the instrument of that poem." A writer of poetry has an "optimistic hope that someone will read it in the future." 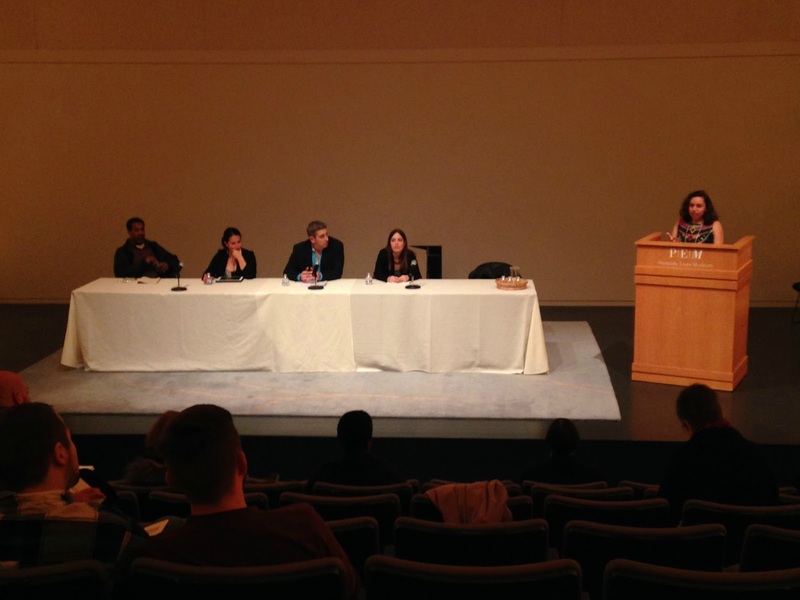 Another enjoyable session, one that is held every year, was a panel discussion on the "State of Poetry." This year's panel was outstanding (left to right in the photo below): Gregory Pardlo, Ada Limón, Richard Blanco, and Sandra Beasley. Jennifer Jean was the moderator. GP spoke of the "transmany," that is, today's poets claim a broad range of American-ness rather than one identity. He also said poets are in conversation with the larger world--they can no longer assume there is one audience for their work. AL noted that the proliferation of social media enables a single poem to be shared and reshared, and, it can end up being read by those who don't normally read poetry. It also provides an opportunity for poets to easily "brand" themselves. RB added that the "diversity of the self" is evident today. He identifies himself as Richard the gay guy, Richard the Cuban, Richard the engineer, and also Richard the poet. Blanco thinks we should drop the word diversity and use inclusive instead. SB said, "You can engage through the act of listening" and that we should stop the "white framing" and listen to other voices. I didn't note who said it, but one of the panelists said that "poetry as entertainment is okay." One more session I'll mention had a panel with Laurin Becker Macios, David Rivard, and Charles Simic. Macios studied under Rivard and Simic at UNH and shared that once, after reading a poem in class, Simic told her, "It's a great poem, I think it needs a cat in it." She said, "Charlie taught me to be playful." She told the group that her college work was "overgrown with metaphors, but David taught me to landscape." An interesting statement from Rivard: "'Who fed you the poison eels?' is one of the questions of poetry." The B & B I stayed at while at the festival is the Stepping Stone Inn. It is the blue building next door to the witch museum. This was the second year I've stayed there, and I definitely recommend it! Many of the festival's sessions took place at the Peabody Essex Museum, and although I didn't go to view the art and artifacts, I couldn't help but notice the surroundings as I went between rooms. Here are two very striking floors that I simply had to photograph! Violet Nesdoly/Poems is hosting the Poetry Friday Round-Up this week, so please stop by! Thank you, Diane, for another year's peek into this wonderful-ness! One of these years... I do love Salem. My cats concur, by the way, with that sage poem advice. It's easy enough for me to include a cat in a poem! I'm glad every year when you share a peek of this time, Diane. Thanks for the wisdom given, and the lovely pictures. I love the "cat" advice, and it reminds me of an article with advice I read that I used with students. I told them the poems could be any topic but they had to have water somewhere in them. What they did with just that one idea was wonderful. Those floors/rooms! Thanks for sharing these tidbits with us. I am pondering those poison eels. I agree with Blanco re: dropping "diversity" in favor of "inclusive." Did you know that eels have poisonous blood, but if the eels are cooked they are okay to eat. Make of that what you will! Oh my, I am jealous, Diane! I have the book How to Read a Poem and Fall In Love With Poetry by Edward Hirsch and would love to hear him in person. It sounds like an all-round enriching and colorful experience--down to the floors (they are quite incredible)! I've seen him twice, and both times were outstanding. You can modulate your voice, speed up or slow down, pause meaningfully. Give a performance! I love that playfulness is encouraged. I would love to go. Why is it the same weekend as SCBWI. And the same weekend as my son's drama festival. Sigh. Thanks for being generous with these tidbits. I hear ya! There were three other things that weekend that I could have gladly attended! This sounds like such fun, Diane, on so many levels. Loved this wise advice:"Read a poem aloud--you are the instrument of that poem." I still have problems hearing myself read my own work. It's crucial, though, with the rhyming stuff. Good to know that "poetry as entertainment is okay." Absolutely! What you can't enjoy, you tend to avoid. 1) "Read a poem aloud--you are the instrument of that poem." Love that. I've always got the cats covered. Also, hyacinths! Thanks for stopping by Sandra! The links look interesting and worth spending some time with. I gave the first link a quick glance and this caught my eye, "Poetry — especially love poetry — is forbidden to many of Afghanistan’s women: it implies dishonor and free will." It's amazing what women have to do in secret to preserve something that is dear to them. That idea is at the center of Snow Flower and the Secret Fan by Lisa See, a women's book group favorite ten years ago. Lots to think about! This sounds like such a great time - and so close by, too! I need to check it out for next year. Definitely come down next year, Donna! It's a great venue, and of course, an admirable group of poets and poetry advocates.